Melita CC 123 for 4 (S Byrne 36, M Towns 32; B George 1-11) defeated Krishna CC 122 all out (V Prasath 37*; J Hirschi 3-15, M Towns 3-21). Melita CC were convincing winners thanks largely to the impressive all-round performance of Matthew Towns. Krishna batted first and lost their first 5 wickets for 36 runs. A 43-run partnership for the last wicket salvaged some pride in an otherwise disappointing batting effort. For Melita, Jurg Hirschi and Towns captured 3 wickets each. Melita’s run chase was comfortable with Sean Byrne (36 not out) and Towns (30 not out) leading the way. National junior player Ethan Xuereb guided Melita to victory with 27 balls to spare. This weekend sees Game 6 of the 2017-18 Winter League between Marsa CC and Melita CC. The losers of this clash can bid farewell to their chances of clinching the Winter League title. Winter League table (5 matches) – Krishna 44, Melita 24, Marsa 20. Batting: Niraj Khanna 105 runs; Bowling: Varun Prasath & Amar Sharma 6 wickets. Fielding: Sam Aquilina and Amar Sharma (3); Andrew Naudi and Sean Byrne (2). Luxembourg celebrate series win over Malta. 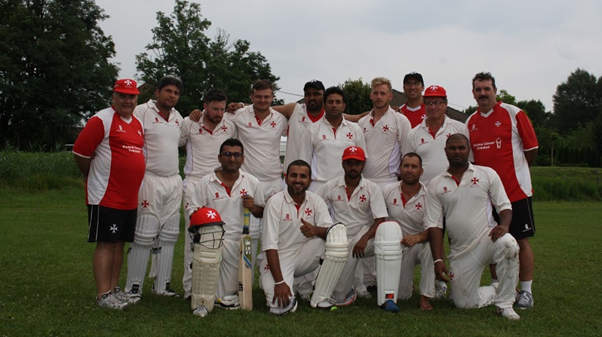 The Malta Cricket team hosted the Luxembourg national team over the weekend, in which the visitors sealed a series win. After recent victories over Hungary, Russia, Poland, Romania, Bulgaria and the Czech Republic; the Malta team were in confident mood but missed chances would prove costly in all three matches. Proceedings began with Friday’s opening ceremony as both teams stood for their respective national anthems and were greeted by Hon. Chris Agius, Parliamentary Secretary for Research, Innovation, Youth and Sport. After Luxembourg were sent in to bat, William Heath (67) and Tim Barker (31) laid the foundation for a decent score with a second wicket partnership of 61 runs. Vikram Vijh shifted the momentum in Luxembourg’s favour with seven boundaries in his 48 runs from only 25 balls. His cameo catapulted Luxembourg from 65 in the first 10 overs to a total of 164 for 3 from their allotted 20 overs. For Malta, Andrew Naudi and George Agius took a wicket apiece. Malta’s reply lacked the required conviction and application. Captain Nowell Khosla (27) and Andrew Naudi (22) provided some resistance but it was to be a convincing victory for Luxembourg by 63 runs. Off-spinner Chris Fry was the main wicket-taker with 4 for 18 runs. Luxembourg once again batted first and posted an imposing 30 over score of 271 for 9, led by Tim Barker (83 off 50) and Vikram Vijh (56 off 32). Opener, Joost Mees also contributed a valuable 42 runs. The visitors were particularly severe on all of the nine Malta bowlers used. For the home side, Niraj Khanna and Feroz Ahmed took 2 wickets apiece, John Grima was particularly tidy behind the wickets and Mark Sacco held two excellent catches in the outfield. Malta’s riposte began poorly with the early wicket of Sam Aquilina. 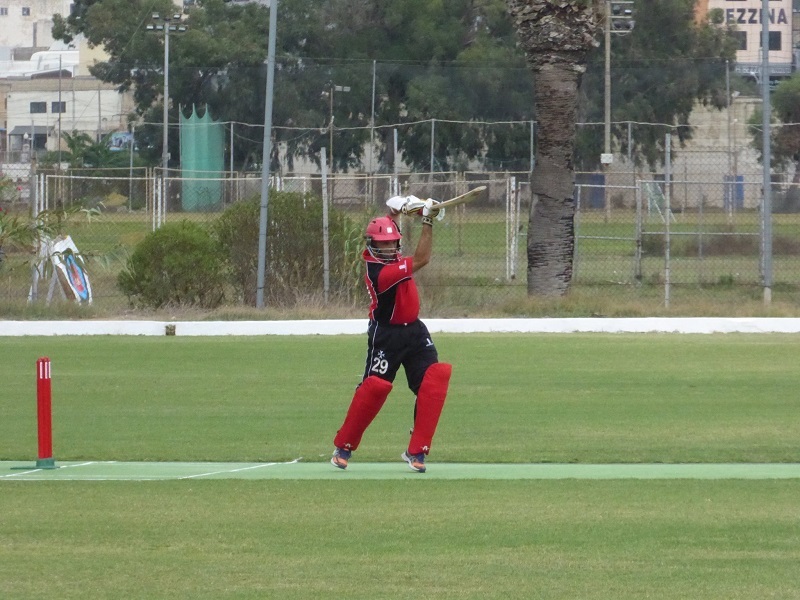 Nowell Khosla (31) and Andrew Naudi (15) saw Malta recover to 52 for 1, before both batsmen fell in quick succession. Niraj Khanna scored his highest international score (65) as he shared in a 79 run partnership with Bikram Arora (15). Luxembourg’s comprehensive victory was complete as a flurry of Maltese wickets followed (6 wickets for only 15 runs). Paul Bradley and George Agius saw Malta to the close, as they reached a respectable score of 158 for 9. For Luxembourg, youngsters Luka Dacic (2 for 21) and Chris Fry (2 for 27) were the pick of the bowlers. Captain Tony Whiteman also chipped in with 2 timely wickets. Luxembourg won the toss and elected to bat in the all-important 3rd match of the series with Malta looking for some consolation after two disappointing losses. Luxembourg’s batting did not disappoint with contributions from all their batsmen. Chris Fry (72) and William Cope (40) provided a solid base for some late hitting by Tim Barker (34 off 18 balls). Malta’s spinners Andrew Naudi and Ronnie Sacco kept the Luxembourg batting line-up in check throughout the late overs and Malta went into lunch content with restricting the visitors to 266 for 7. 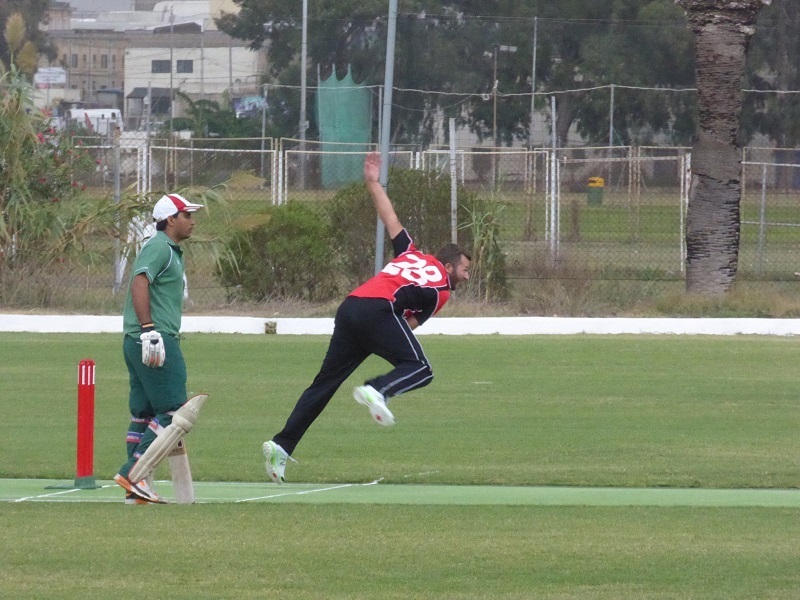 For Malta, David Marks took 2 wickets for 48, while wicket-keeper Sam Aquilina snared a stumping and a catch. After losing Aquilina with the score at 13, Nowell Khosla and Frank Spiteri set about consolidating the Malta innings. The pair reached the first drinks break with Malta at 60 for 1 from 15 overs. By the 30th over, they put on a further 100 runs and brought up their individual fifties. After a superb 144 run partnership, Khosla was finally caught in the deep for 70 runs. Niraj Khanna joined Spiteri and the pair put on another 32 in quick succession before Spiteri was adjudged LBW just 5 runs short of his century (95). With 60 runs required off the final 10 overs, Malta were still well placed for victory, however the dismissal of Khanna (25) and Naudi (23) saw the momentum shift again in Luxembourg’s favour. The Maltese lower order failed to see the home side through to victory, falling short by just 18 runs. The bowling honours for Luxembourg went to pace bowler Atif Kamal with 2 wickets for 28 from his 9 overs, while Vikram Vijh captured 2 for 29. 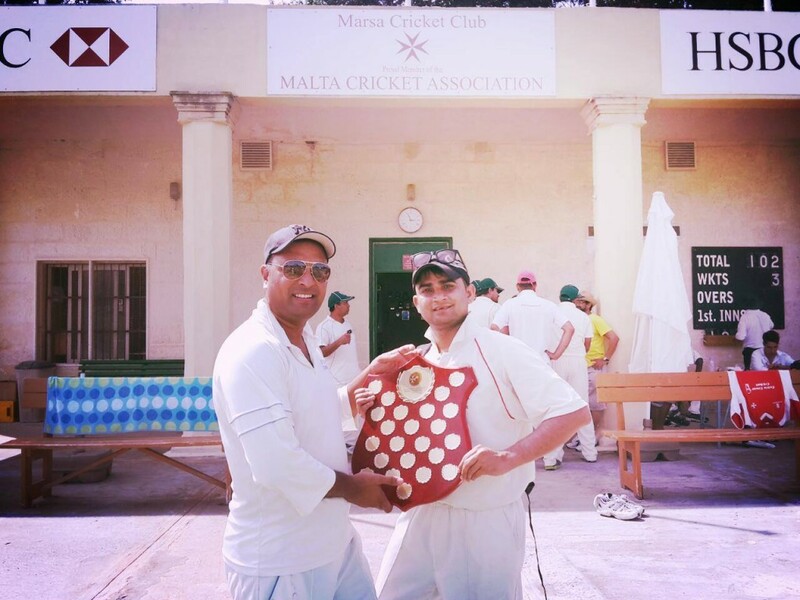 The series saw Frank Spiteri become the first Maltese batsmen to pass 1500 international runs while Andrew Naudi became Malta’s most capped international cricketer with 55 caps, overtaking Malta’s all-time great all-rounder Michael Caruana (53 caps). At the presentation ceremony, Luxembourg captain Tony Whiteman received the Winner’s Trophy, while Chris Fry was voted the Player of the Series with 77 runs and 7 wickets. Luxembourg 164 for 3 (Heath 67, Vijh 48; Agius 1-24) defeated Malta 99 all out (Khosla 27; Fry 4-18). Player of the Match: Chris Fry (Luxembourg). Luxembourg 271 for 9 (T.Barker 83, Vijh 56; Ahmed 2-36) defeated Malta 158 for 9 (Khanna 65; Dacic 2-21). Player of the Match: Niraj Khanna (Malta). Luxembourg 266 for 7 (Fry 72, Cope 40; Marks 2-48) defeated Malta 248 for 7 (Spiteri 95, Khosla 70; Kamal 2-28). Player of the Match: Frank Spiteri (Malta). Umpires: Les White, Joy Ghoseroy, Kevin Krishna, Subhas Roy. 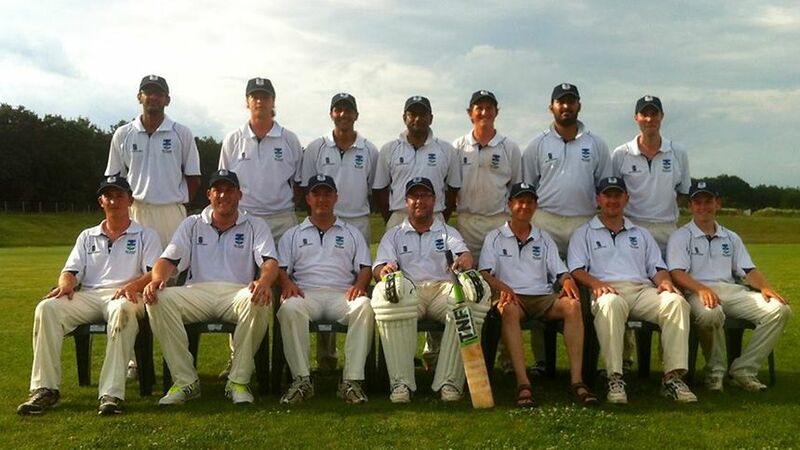 Malta Cricket look forward to Luxembourg challenge. 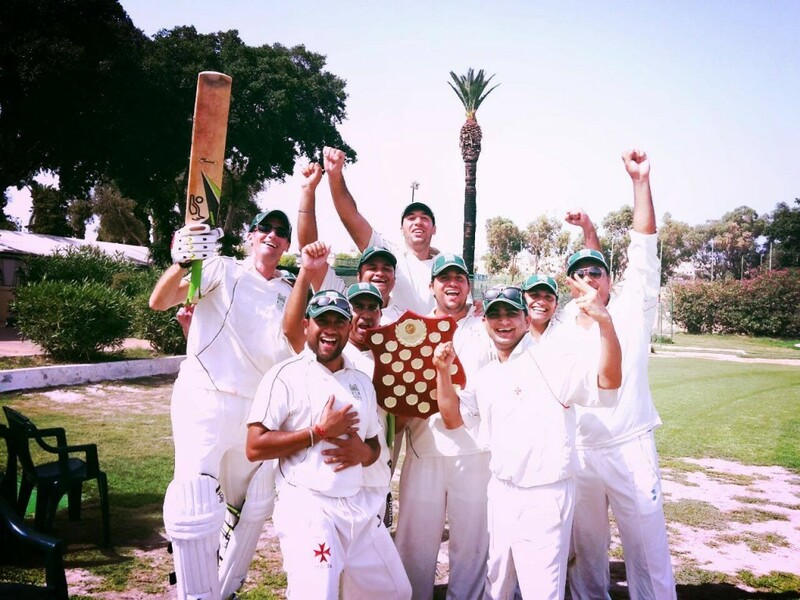 This weekend the Malta Cricket team faces a stern challenge from Luxembourg over three consecutive days at the Marsa Sports Club. The teams last met in the European Division 2 Championships in 2012, when Andrew Naudi led the Malta team to a thrilling victory, scoring 66 runs from only 27 balls. Since then, both teams have tasted success competing in the European Cricket Development League. Malta won the 2014 Pan European T20 tournament in Hungary, whilst Luxembourg were victorious in the 2015 Continental Cricket Cup in Romania. The Malta team is looking to further strengthen their recent record, which stands at 13 wins from their last 16 internationals. Nowell Khosla (captain); Bikram Arora, Andrew Naudi, Frank Spiteri, George Agius, Mark Sacco, Ronnie Sacco, Sam Aquilina, John Grima, David Marks, Paul Bradley, Sean Byrne, Zubair Mohammed, Sumair Khan, Feroz Ahmed Akbar, Niraj Khanna, Siddharth Anand, Kalki Kumar. Tony Whiteman, William Heath, Atif Kamal, Christopher Fry, James Barker, Joost Mees, Luka Dacic, Richard Neale, Suhail Sadiq, Timothy Barker, Vikram Vijh, William Cope. 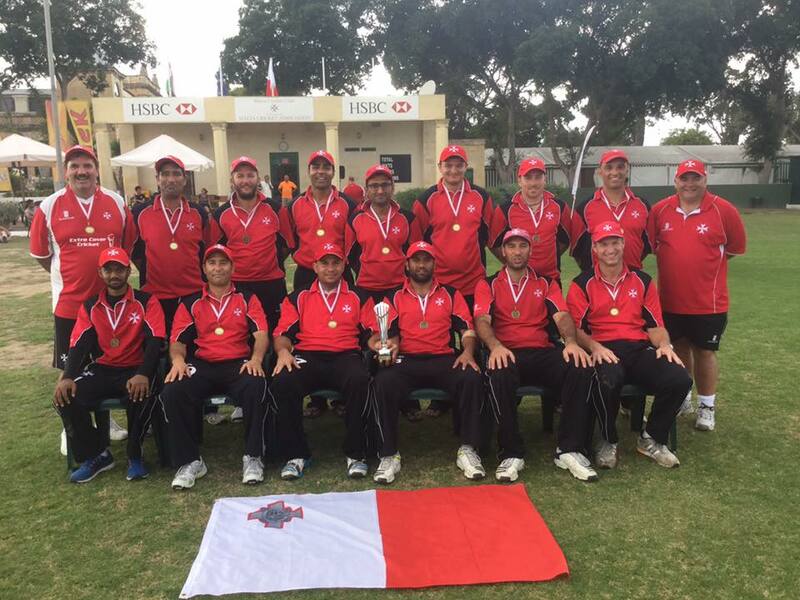 Pan European T20 Tournament – Malta finish 2nd. 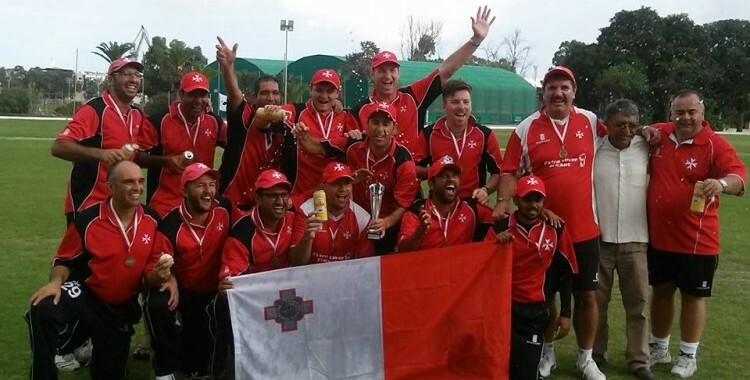 The Malta Cricket team finished a gallant 2nd in the Pan European T20 tournament after reaching the final with three comprehensive victories in the group stages. Malta’s tournament started with an emphatic 9 wicket win over eventual tournament winners UCT from Dubai. Against Bulgaria, the Malta team enjoyed their most comprehensive win in T20 internationals (by 119 runs). The team then qualified for the final defeating hosts Hungary by 7 wickets. Sunday afternoon’s final began with UCT winning the toss and electing to field first. Malta made steady progress but lost captain Nowell Khosla (8) and Vice-Captain Bikram Arora (10) within the first 8 overs. Haroon Mughal’s 38 off 24 balls took Malta to 97 for 3 off 12 overs, however his wicket saw UCT seize the initiative. Malta reached the respectable tally of 145, largely thanks to Zubair Raja who finished unbeaten on 31. In reply, UCT lost two early wickets and scored 36 for 2 from the 6 over Powerplay. 24 runs came from the preceding two overs and shifted the momentum to the UCT team. Opening batsman Ali Azmat rode his luck and notched up an unbeaten 95 to steer UCT to victory by 7 wickets. For Malta, Agius, Bradley and Chellew shared the wickets to fall. It was a bitter pill to swallow for the Malta team, especially after defeating UCT so convincingly on the opening day of the tournament. The team did Malta proud but failed at the final hurdle in their bid to defend the trophy they won so well in 2014. 1st: UCT; 2nd: MALTA, 3rd: Romania, 4th: Hungary, 5th: Bulgaria. Malta jispiċċaw it-tieni fit-Turnament Pan Ewropew T20 tal-Krikit. It-Tim Nazzjonal Malti tal-Krikit, tilef fil-final, wara li kkwalifika għal din l-istess final permezz ta’ tliet rebħiet konvinċenti. It-Turnament għat-tim Malti beda tajjeb ħafna meta għelbu b’disa’ wikits lil UCT Dubaj, liema tim eventwalment rebaħ it-turnament. Kontra l-Bukgarija t-tim Malti rebħu b’vantaġġ ta’ 119-il ġirja, li huwa wkoll rekord f’kompetizzjonijiet T20 għall-Maltin. Wara għelbu lill-Ungerija b’vantaġġ ta’ seba’ wikits biex b’hekk għamlu ċert mill-final. Il-Ħadd waranofsinhar, fil-final, UCT Dubaj, għażlu li jiffildjaw l-ewwel. Il-Maltin ma qagħdux lura għalkemm tilfu lill-kaptan Nowell Khosla (8) u l-viċi-kap Bikram Arora (10) wara l-ewwel 8 owvers. Haroon Mughal kiseb 38 ġirja minn 24 ballun, u hawn Malta kienu tellgħu 97 ġirja għal 3 minn 12-il owver. Iżda malli nqala’ Haroon, it-tim Malti ħass in-nuqqas ta’ dan il-plejer, biss Malta xorta rnexxielhom itellgħu skor tajjeb ta’ 145 ġirja, grazzi wkoll għall-Zubair Raja li kiseb 31 ġirja bla ma nqala’. Fl-Innings tagħhom, Dubaj tilfu żewġ wikits kmieni u tellgħu 36 ġirja għal żewġ wikits mis-6 owvers milgħuba fiċ-ċirku ż-żgħir. Il-Battitur ta’ Dubaj, Ali Azmat tella’ 95 ġirja bla ma nqala’, u tista’ tgħid li kien hu l-mutur wara r-rebħa ta’ UCT Dubaj fuq Malta għal 7 wikits. Agius, Bradley u Chellew laqtu wikits għal Malta. 1. UCT Dubaj; 2. MALTA, 3. Rumanija, 4. Ungerija, 5. Bulgarija. Malta team go top after battering Bulgaria. Malta 183 for 1 (C.Chellew 109*, N.Khosla 34) defeated Bulgaria 64 (H.Mughal 3-15, S.Khan 3-16, P.Bradley 2-5). The Malta cricket team once again cruised to a thumping victory by beating Bulgaria by 119 runs. It was Malta’s biggest win in a T20 international. Malta’s total of 183 included a century for Chris Chellew and 34 runs from Captain Nowell Khosla. A great team display in the field saw Bulgaria restricted to the lowest team score of the tournament (64 runs). Haroon Mughal, Sumair Khan and Paul Bradley were the major wicket-takers, while Mark Sacco did a fine job as stand in wicket-keeper, taking 2 catches. Malta now sit top of the table with 7 points, and a result against hosts Hungary in Sunday’s early game will cement their place in the evening’s final. Malta team begin with solid victory over UCT. 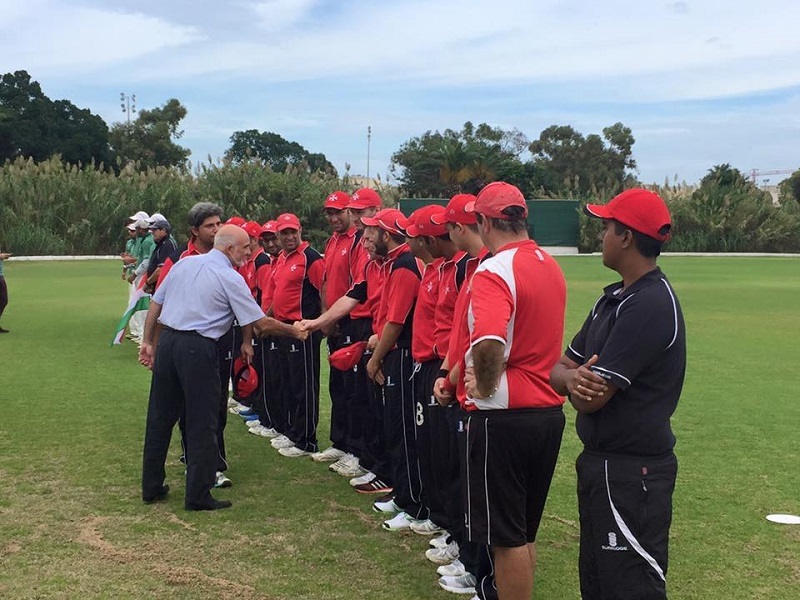 The Malta cricket team began the Pan European T20 tournament with a thumping 9 wicket win over UCT from Dubai. 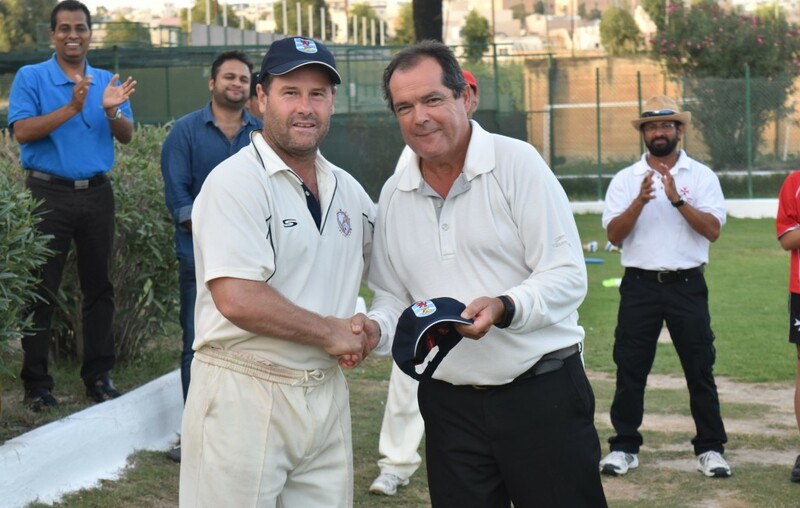 Malta cruised to victory largely due to an unbeaten 81 run partnership between Bikram Arora and Chris Chellew. Tomorrow (Thursday) Malta will take on Romania at 10:00am. It-Tim Nazzjonal Malti tal-Krikit, beda dan it-turnament importanti b'rebħa solida kontra UCT Dubaj. It-Tim Nazzjonal Malti wera s-saħħa tiegħu b'din ir-rebħa li fiha rat lill-Maltin jiksbu xejn anqas minn 9 wikits. Bikram Arora u Chris Chellew kellhom sehem kbir f'din ir-rebħa bil-81 ġirja li tellgħu bi sħab. Melita stay in touch with victory. 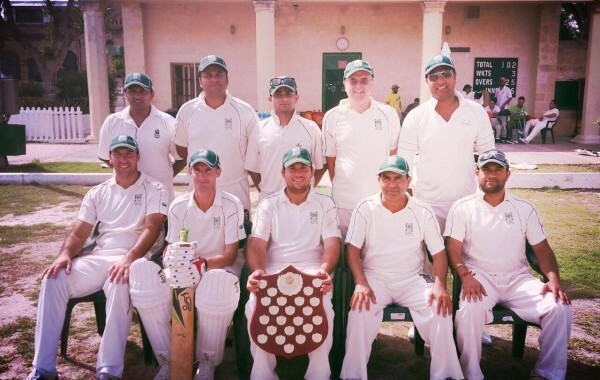 Malta Cricket League: Melita stay in touch with massive victory. Match 4: Melita CC 163 for 7 defeated Krishna CC 39 all out. Justin Farrin-Thorne bowled Melita to victory over Krishna with an inspired spell of 4 wickets for 8 runs. Earlier his side a reached a respectable 163 runs, thanks largely to Derek Ali (37*) and Frank Spiteri (25*). Farrin-Thorne also chipped in with a valuable 21 runs, while Ben Aquilina made a valiant 15. Jayden Rossouw was the pick of the Krishna bowlers with 2 wickets for 21 runs. A calamity of batting errors saw Krishna reduced to just 18 runs for 3 wickets from their opening 6 overs. It went from bad to worse for them as they were dismissed for a paltry 39 runs in only the 12th over. Farrin-Thorne’s astonishing match was made complete as he threw down the wickets from the mid-wicket boundary for a run out that sealed victory for Melita by a massive 124 runs. Jain Ganapathy and Zubair Raja took the other wickets to fall. Next weekend sees the completion of Round 1 of the Malta Cricket League with Krishna CC v Malta Marauders CC (Sat 10:30am) and Marsa CC v Melita CC (Sun 10:30am). On Thursday 14th, The Malta national squad faces a Malta Select XI in the first of two warm-up matches before competing in the Pan European T20 International Tournament in Hungary later this month. 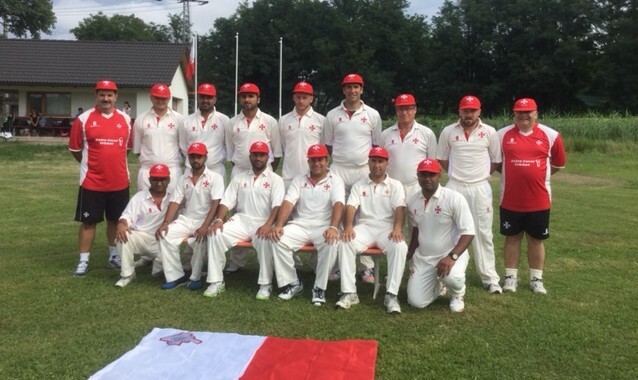 The Malta Cricket team hosted the Hungary national cricket team last weekend, in which it sealed a 2-1 series win and consolidated its excellent record in the newly formed European Development Cricket League. From their last 12 internationals, Malta have won an impressive 10 matches and lost only 2. The victories over Hungary added to recent triumphs over Russia, Poland and the Czech Republic. Back row, David Carlisle (coach), Ronnie Sacco, Andrew Naudi, Niraj Khanna, Haroon Majeed, George Agius, Chris Chellew, Frank Spiteri, Mark Agius (MCA Chairman). Front row, Parth Mehta, Mark Sacco, Nowell Khosla, Bikram Arora, Sam Aquilina, Malcolm Crabbe. Parliamentary Secretary for Research, Innovation, Youth and Sport. The first T20 international was Andrew Naudi’s 50th appearance for the Malta national team, second only to Michael Caruana (53 caps). Frank Spiteri – the first Maltese batsman to pass 1500 international runs. each). Malta’s keeper Sam Aquilina captured 2 stumpings and a catch while Mark Sacco, Chris Chellew and Haroon Majeed took 3 excellent outfield catches. Friday’s 2nd T20 began after a warm welcome from Malta Olympic Committee President, Julian Pace Bonello. It was an improved batting performance by the Hungarians with Marc and Stan Ahuja scoring 48 and 51 respectively. The pair combined in an 86 run partnership off only 13 overs. 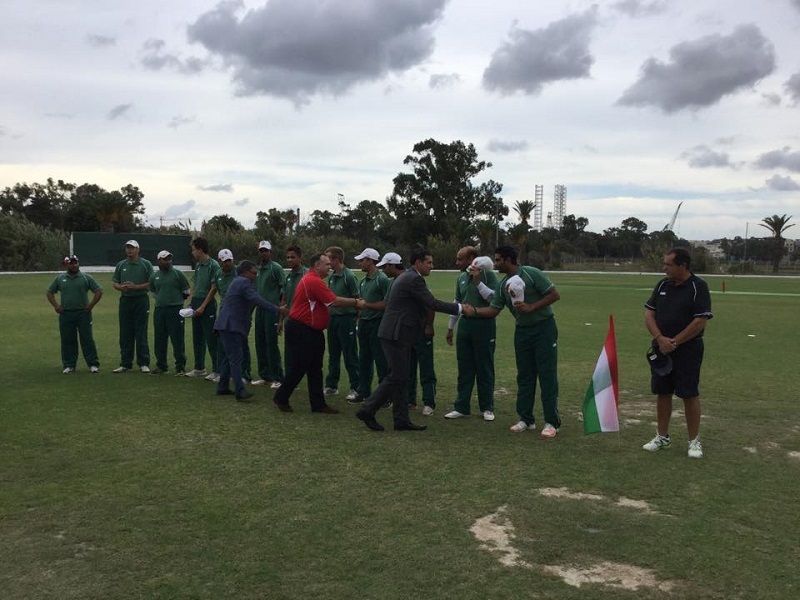 The Hungarians were especially severe on the Maltese bowling during the middle overs and 7 sixes catapulted them to a competitive total of 151 runs for 6 wickets. For Malta, Naudi, Khosla and Mehta took a wicket apiece. The Maltese run chase stuttered throughout and the run outs of Khosla (8) and Naudi (4) were particularly costly to the home side’s hopes. Following the dismissal of Niraj Khanna for 15, a fighting partnership between Majeed (36) and Mehta (24) brought Malta back into the contest. 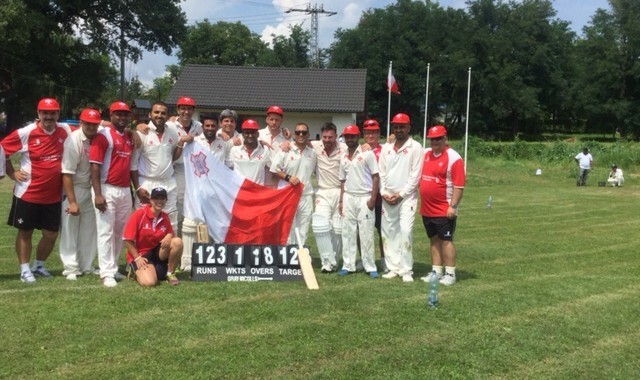 However, the demise of Ronnie Sacco, Sam Aquilina and Malcolm Crabbe signaled the end for Malta as they were bowled out for 133, handing victory to Hungary by 18 runs. Sunday’s 3rd and final match in the series was a 50 over – One Day International. Proceedings started early with Hungary electing to bat. A more focused and disciplined effort in the field by Malta saw Hungary dismissed for only 123 runs in 40.5 overs. It was once again Stan Ahuja (44 runs) who held the Hungarian batting line up together. Like Thursday, it was a real team effort by Malta and Parth Mehta (4 for 14) was well supported by all the other Malta bowlers. The home team’s reply began briskly with Nowell Khosla striking 4 early boundaries before he was clean bowled by fast bowler Zeeshan Khan. Following the lunch-time presentation by H.E. 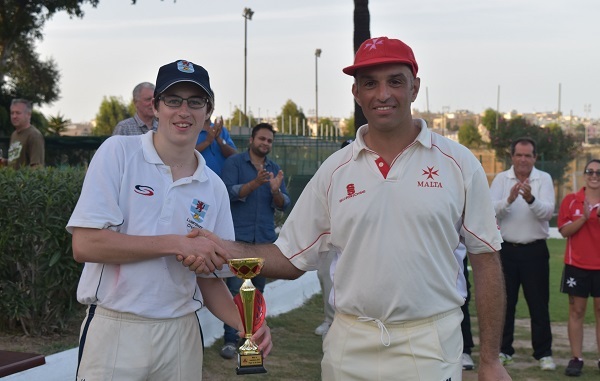 Jane Lambert, the Australian High Commissioner to Malta; Frank Spiteri and Chris Chellew added an unbeaten 85 runs which sealed the victory for Malta with 27 overs to spare. Chellew’s 62 made him the top run scorer in the series, while Spiteri’s 26 runs made him the first Maltese batsmen to pass 1500 international runs for his country. 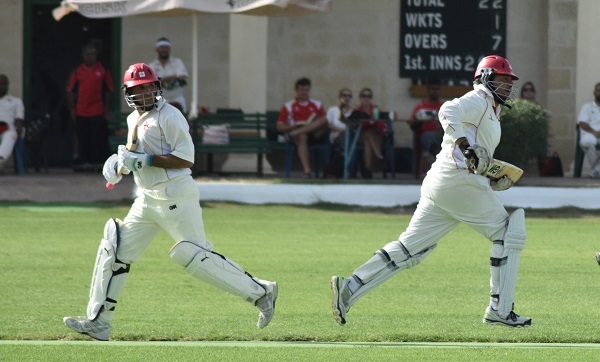 This brought to an end a very successful weekend for Malta Cricket and the 3-day event also raised a generous amount in aid of the Malta Community Chest Fund. Marsa CC 165 all out (T.Azzopardi 32, L.Azzopardi 22; N.Khosla 2 for 9) beat Krishna CC 102 for 3 (S.Aquilina 27*, N.Khosla 21) by 63 runs. Sunday’s final match of the Malta Cricket’s CricHQ Summer League saw Krishna CC face Marsa CC in what was a league decider. Marsa not only needed to win the game but pick up more bonus points than their opponents to take the title. The match at the Marsa Sports Club started with Krishna winning the toss and electing to field first. Marsa captain Tony Azzopardi (32) and Mark Sacco (20) made a brisk start, putting on 39 runs in the first 6 overs. Sher Khan (21 runs off 13 balls) and Liam Azzopardi (22 off 21) kept the momentum going during the middle overs. A cameo by Ronnie Sacco (13 off 11) saw Marsa finish their allotted 25 overs on 165 all out. For Krishna, Nowell Khosla (2 wickets for 9 runs), Sid Anand (2 for 30) and Kevin Krishna (2 for 37) were the major wicket-takers. Arora and Khosla also picked up crucial run outs to see Krishna pick up 4 bonus . To win the title, Marsa now needed to bowl Krishna out. Krishna’s chase of 166 started impressively with man of the moment Sam Aquilina remaining unbeaten on 27 runs off his allotted 30 balls. Captain Nowell Khosla (21 off 17) and Bikram Arora (15 off 13) were both dismissed just as they started dominating the Marsa bowling attack. Krishna reached 41 runs in their first 7 overs but Ronnie Sacco and K.Kartik pulled back the run rate with a combined 10 over spell for only 29 runs. It effectively ended Krishna’s chances of winning the game but meant they only needed to keep wickets in hand to win the league title. John Rusher’s 1 run (not out) was arguably the most valuable of his career as he occupied the crease for his entire allotment of 30 balls. Justin Farrin-Thorne and Sharon Lazar saw Krishna CC to the end, as they finished on 102 runs for 3 off their 25 overs. Marsa picked up 13 points for their victory but fell tantalisingly short of capturing the league title. It brought to an end a very successful CricHQ Summer League with final standings as follows: Krishna CC 67, Marsa CC 65, Melita CC 54, Marauders CC 25. Leading performers were Bikram Arora (Krishna), Haroon Mughal (Marsa), Andrew Naudi (Melita) and Dean Arnold (Marauders). Bikram Arora won the league’s Most Valuable Player and the Batting Award (177 runs), while the Bowling Award went to Sarfraz Ali (10 wickets). 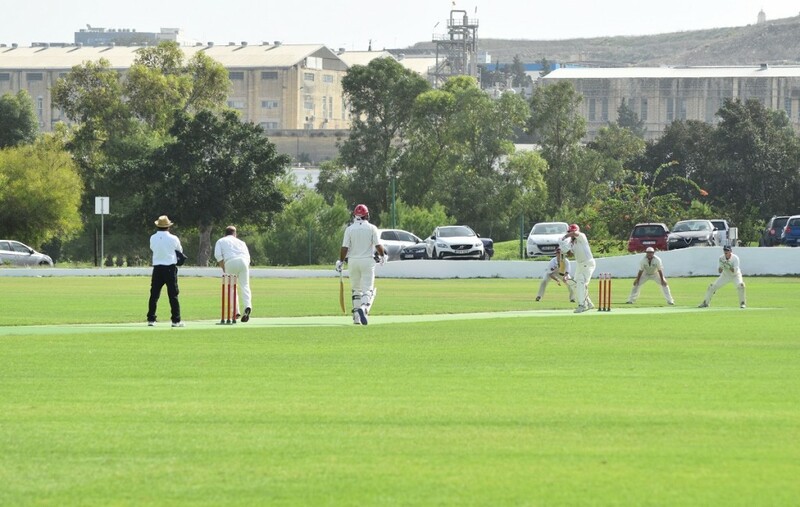 This weekend sees the resumption of Malta Cricket’s touring team series with Tongham Cricket Club visiting from Surrey, UK. They will face the Marsa Representative side on both Saturday and Sunday with matches starting at 10:30am. The Malta Cricket Association is pleased to announce its squad for the forthcoming Malta T20 cricket tournament being held at the Marsa Sports Club, Malta between 01- 04 October. Nowell Khosla (Capt), Sam Aquilina, Bikram Arora, George Agius, Chris Chellew, Haroon Mughal, Frank Spiteri, Niraj Khana, Ronnie Sacco, Mark Sacco, Andrew Naudi, Malcolm Crabbe, Parth Mheta. The Malta team went through their paces this week with cricket professional Daniel Salpietro. Daniel is enjoying a very successful season as club pro with Norden Cricket Club in the Central Lancashire League and took time out to assist the national team in their final preparations.